CoLab Radio » Blog Archive » City, Country, or Suburb: How Do I Get Home? City, Country, or Suburb: How Do I Get Home? Randolph, Massachusetts is a difficult place to define. In fact, trying to answer “what is Randolph?” created more than enough work for my MCP thesis at MIT. The relationship between this suburb, Boston, and other South Shore towns is surprisingly complicated. Take for instance the question, “How do I get home to Randolph from Boston?” The map below illustrates three possible routes. 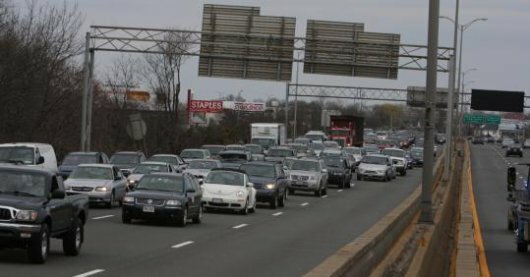 The simple and seemingly obvious first answer is, “Take the Expressway.” Randolph is Exit 5A off of I-93, a 16 mile, 20 minute drive from downtown Boston. Yes, this nice little town is right down the road… the Southeast Expressway… just down there… past the [commuters’ language retracted] Braintree split. You know what this drive looks like. On an average workday, this simple trip may average an hour. My personal record is 2 hours 15 minutes of brake lights and despair. When this common suburban life scene becomes too much to bear, many locals choose the bucolic route instead. 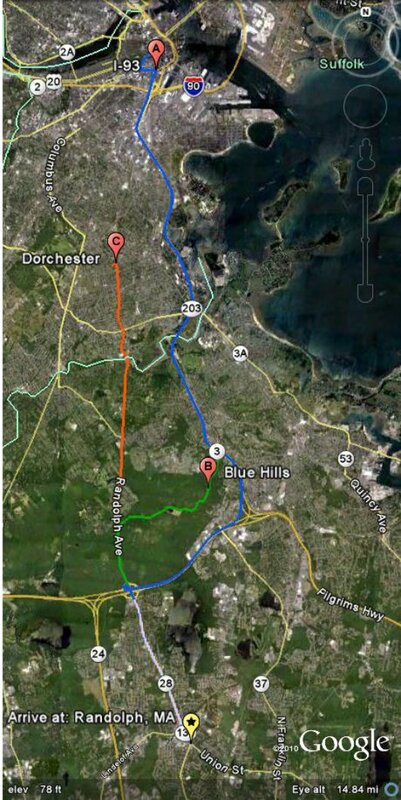 We escape the Expressway well before the Braintree split and enjoy the parkways of the Blue Hills. A small part of the day becomes a gentle ride through the country. 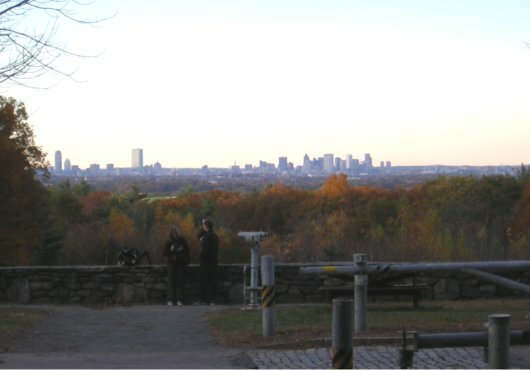 You can even stop off at this scenic point to take in one of the most beautiful skyline views of Boston and forget about that awful Expressway traffic. After you come down from the hills, Route 28 drops you right onto North Main Street in Randolph. This is also the point of entry for anyone driving to Randolph from Dorchester, Mattapan or Roxbury. Randolph is an easy ten-mile or so drive from Dorchester Avenue and Blue Hill Avenue, and several of those miles roll through the Blue Hills and Milton’s large homes. This is the same route the MBTA 240 and the BAT (Brockton Area Transit) 12 buses take. Sometimes I even choose Dot Avenue over the Expressway when I can’t take the traffic and want a city view instead of the brake lights. So why would anyone choose the Expressway to travel to Randolph from these neighborhoods? 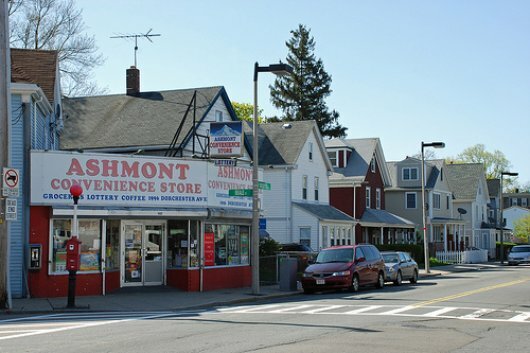 Several African-American families in Randolph reported to me that in the bad old days – back in the 1980s, when the latest wave of first generation suburbanites to arrive in Randolph from Dorchester and Mattapan had black skin and when crime in the city was at a relative high point – they would routinely choose to drive east through Boston neighborhoods to take the Expressway to Randolph. They would choose this circuitous route to avoid being pulled over by police who may have been racially profiling drivers on Rt 28. 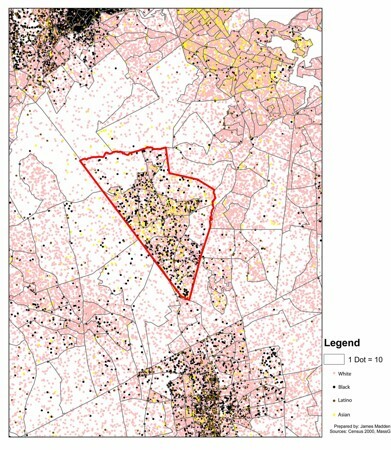 Randolph today is an island of ethnic and racial diversity among more homogenous suburbs and segregated city, as this map of population density by race from my thesis shows. The process of neighborhood change is never easy, and Randolph’s journey has been rocky too. Social, racial, and class dynamics mold our pathways through the city as much as do traffic and personal preferences. How do you get home? That depends. James Madden received his Master in City Planning from MIT in June 2010 and is now an affordable housing professional in Massachusetts. He thinks too hard about paths through the city because he foolishly believes a GPS would be an affront to his manhood.